KCKCC baseball – Page 6 – Welcome to Wyandotte Daily! Steve Burleson has been around baseball far more than his 35 years as head coach at Kansas City Kansas Community College but in all those years, he’s never seen an ending like the one that completed a Blue Devil sweep of Dakota County Technical College Monday. Jonathan May pitched the first 6.1 innings, allowing just five hits, two runs and striking out four with Eric Hinostroza getting the win in relief, giving up just one hit, fanning three and allowing no earned runs. Thrower doubled and singled and Norton singled twice to lead KCKCC’s 6-hit attack. The Blue Devils also had to come from behind for a 5-2 win in the opener. Trailing 2-0, the Blue Devils scored all five of their runs in a rally highlighted by Christian Arnold’s bases-loaded triple. A pinch single by Mitch Glessner following a walk and a one-out single by Norton scored KCKCC’s first run. McKinzie then singled to load the bases and Arnold cleared them with his triple to straight away centerfield. Daniel LaMunyon added the fifth run with an RBI single. KCKCC had nine hits including a double and single by McKinzie and two by Norton. Southpaw Cole Frakes got his first pitching win, allowing just four hits, no earned runs and striking out four. Spencer Nielsen wrapped up the win, allowing just one hit in two innings for his first save. “Frakes and May both gave us good innings and Nielsen and Hinostroza came in and threw strikes,” Burleson said. The Blue Devils returned to the road Tuesday, playing a doubleheader at Brown Mackie before taking on yet another Jayhawk Conference power Cowley Thursday at Arkansas City and Saturday at home. Cowley, Johnson County and Coffeyville, the team the Blue Devils play next week, are all 12-0 in Jayhawk play. Kansas City Kansas Community College will be home for baseball doubleheaders both Saturday and Monday. The Blue Devils will play host to Johnson County Community College Saturday and Dakota County Community College Monday, both at 1 p.m. The unbeaten leader in the Jayhawk Conference with a 10-0 record, Johnson County swept KCKCC 9-3 and 13-8 in Overland Park Thursday. 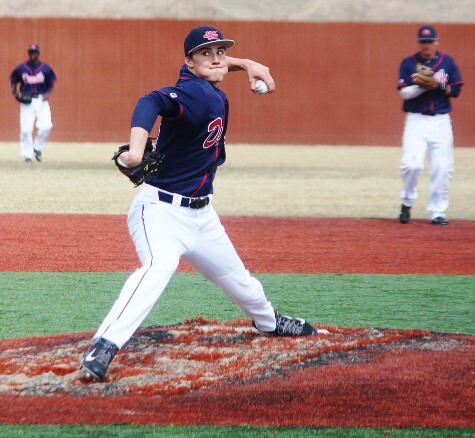 Kansas City Kansas Community College’s baseball team took to the road to Fort Scott Monday in hopes of snapping a four-game Jayhawk Conference losing streak. Neosho County completed a four-game sweep of the Blue Devils Sunday, pounding out a total of 23 hits in 9-2 and 12-6 wins. The sweep dropped the Blue Devils to 1-5 in the Jayhawk and 4-9 for the season while Neosho improved to 7-1 in league play and 17-3 overall. KCKCC led twice in the second game, taking a 1-0 lead in the second and going ahead 4-2 in the fifth only to have Neosho score four times in the sixth and six in the seventh in the 12-6 win. Seven Panther runs came on home runs, 3-run shots by Dylan Christie and Justin Warne and a solo shot by Casey Johnson. 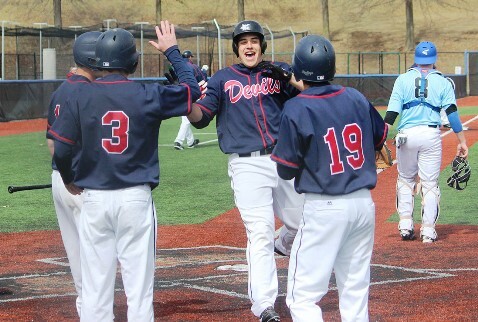 Garrett McKinzie drove in three runs on a pair of singles for the Blue Devils while Christian Arnold rapped his second home run of the season and singled. Daniel LaMunyon, Sam Baxter, Tanner Foerschler and Mitch Glessner had the other Blue Devil hits. E.J. Merlo worked the first 5.2 innings, giving up six hits and four runs before Neosho e used four hits and two walks to score six times off Eric Hinostroza in the sixth and seventh. The Panthers grabbed a 3-0 lead in the second inning and added two more runs in both the third and fourth on the way to the 9-2 win behind Casey Quinlan in the opener. The Blue Devils were limited to just six hits, two by Tanner Foerschler, a double by Daniel LaMunyon and singles by Lucas Norton, Garrett McKinzie and Danny Kralicek, Preston Bailey (1-2) took the loss, giving up five runs in 2.1 innings before Jonathan May finished the 7-inning game.